A senior Iranian diplomat has ruled out any joint cooperation with the United States to fight against ISIL Takfiri terrorists. “We have no plans for joint work with the US [in the battle] against Daesh ([ISIL), but we will continue our help and consultations at the request of the Iraqi and Syrian governments,” Iran’s Deputy Foreign Minister for Arab and African affairs Hossein Amir-Abdollahian said in an interview with Iran’s Arabic-language news channel, al-Alam. He added that Iran was among the first countries to help Iraq and Syria fight terrorism and the ISIL Takfiri groups. The Iranian official reaffirmed that the Islamic Republic will continue its support for the regional countries endangered by terror threats in a bid to help them fight terrorism. He said Washington has also announced plans to fight ISIL terrorists, but it is pursuing double standards. The ISIL Takfiri terrorist group, with members from several Western countries, controls swathes of land in Iraq and Syria. Over the past months, both the Iraqi and Syrian armies, backed by volunteer fighters, have managed to liberate several areas in the country from ISIL militants. Iran has repeatedly stressed that it will not interfere militarily in Iraq and Syria, but that it will continue to provide support for both countries against the ISIL in the form of defense consultations and humanitarian aid. The Iranian diplomat said Saudi Arabia’s resort to violence to solve regional problems, particularly the Yemeni issue, was a strategic mistake. “However, we believe that Tehran-Riyadh ties must return to normal and acceptable relations,” Amir-Abdollahian added. “Iran and Saudi Arabia have potentialities and can settle mutual problems in addition to regional crises and woes through constructive cooperation and interaction,” he pointed out. Iran has received positive signs from Saudi officials on the resumption of “explicit, constructive and effective” dialog between Tehran and Riyadh on ways to fight extremism and terrorism and establish stability in the region, the Iranian official noted. If Saudi Arabia adopts a practical attitude and plays a constructive role, Iran will give a constructive response, he said. 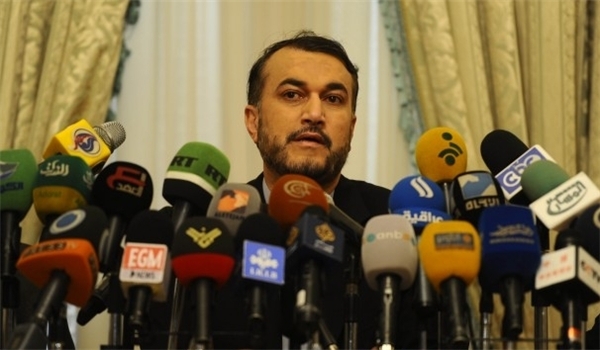 Amir-Abdollahian urged Riyadh to stop war and the killing of civilians in Yemen, end the impoverished country’s blockade and adopt political approaches to regional developments. Saudi Arabia began its military aggression against Yemen on March 26 – without a UN mandate – in a bid to undermine the Houthi Ansarullah movement and to restore power to the fugitive former president, Abd Rabbuh Mansour Hadi, an ally of Riyadh. More than four months of Saudi air raids have caused severe shortages in basic necessities in Yemen. According to the United Nations, the conflict in the impoverished country has killed nearly 4,000 people, about half of them civilians, since late March, while 80 percent of the country’s population needs aid and protection. Many international aid organizations are seeking a safe passage into Yemen to send much-needed medical and humanitarian supplies to the country.